Following up a debut album as well-realized and well-received as Psychocandy is a daunting task, to say the least. Some bands ::cough:: Violent Femmes ::cough:: stumble on their second album and never really recover. 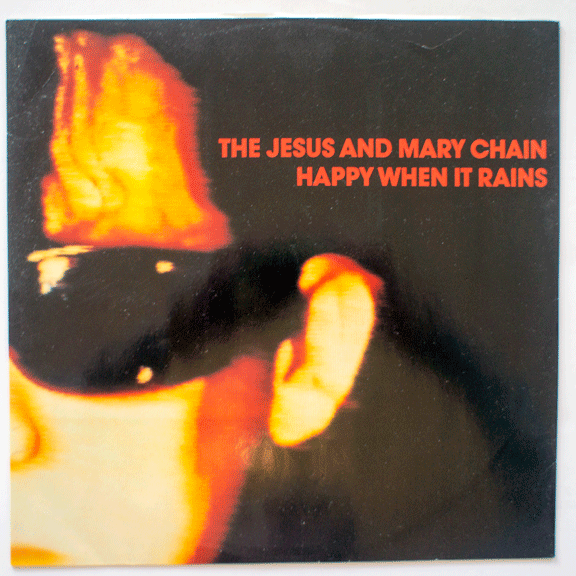 But that didn’t happen to The Jesus and Mary Chain. Despite the abdication of Bobby Gillespe and sacking of Douglas Hart and the addition of — heaven forfend! — a goddamn drum machine, Darklands was a triumph its own terms. And like, say, Reckoning, it was actually more of a blueprint for the rest of their career than the debut was. The headline for Darklands — besides the goddamn drum machine, of course — was the absence of the layers of feedback coating every song. But of course, the feedback and noise was only ever part of what was going on with their music. So while the tension was gone between the wall of squealing guitars and their sure-shot singalong pop melodies, they still had those sure-shot singalong melodies. Over and over again Jim Reid reaches for the clouds causing the rain with his vocals, as if he’s forgotten just how cool he’s supposed to be, and over and over again he drops back down to his normal detached voice, only to get excited all over again. “Happy When it Rains,” I think, was my pathway into Darklands. It was so light and buoyant — and so catchy — that it allowed me let myself to get into the slower songs that dominated the album. And of course, this is the video — which pretends that there are folks other than the Reid brothers making this music — that provides the album cover.